Smart gun technology can potentially provide a solution to many gun control issues. Nationally, the number of accidents due to misuse or stolen firearms results in tens of thousands of deaths per year. In order to address the problem, the Department of Justice has been trying to boost the development of technology that ensures safety and prevents accidental deaths that occur with firearms. Some of those ideas include smart systems that ensure an unauthorized person is not handling the weapon. With this technology, biometric systems require fingerprint identification in order to unlock the weapon. Other innovations involve RFID chips that constantly track the location of the gun. When companies develop this “smart gun” technology they may be eligible for R&D tax credits which are available to stimulate innovation. Eligible costs include employee wages, cost of supplies, cost of testing, contract research expenses, and costs associated with developing a patent. On December 18, 2015 President Obama signed the bill making the R&D Tax Credit permanent. Beginning in 2016, the R&D credit can be used to offset Alternative Minimum tax and startup businesses can utilize the credit against up to $250,000 per year in payroll taxes. The statistics on gun violence in the U.S. are alarming. In 2015, there were over 50,000 gun violence incidents in the United States. At least 12,000 of those incidents resulted in death. Common incidents involved gang related fights, self-defense, and accidental shootings. The daily average of gun related deaths was 30 people per day. From this number, over 750 children under the age of 12 were killed due to gun violence last year (2015). Although owners of a firearm legally own it, children under the age of 3 years old often get hold of a weapon. In 2015, chidren under 3 who accesed an unsecure gun resulted in almost one death per week. Less common incidents involved mass shootings which attract widespread media attention and cause farflung effects. In 2015, there were over 100 U.S. metro areas that suffered from a mass shooting. Many of the incidents described above may have been prevented with the use of sophisticated technology. “Smart gun” technology includes the use of RFID chips or biometric ID systems which enable fingerprint access, or a grip recognition system in order for the gun to be unlocked and ready for use. This technology interests police and military officers, because it can be useful in a situation where their weapon is taken and used against them. In that situation, the gun would be of no use to a criminal or assilant because it can only be discharged by the officer. President Obama’s statement of April 2016 mentions the increasing need for gun safety, which should lead manufacturers to increase gun safety innovation. The need for safety measures is growing, but smart gun technology has yet to launch commercially. Although there are plenty of ideas that have emerged, they are not perfected enough to mandate usage. Many professionals such as police officers, military officers, and other professionals require firearms to work properly in order to perform their job. To date, no technology has been perfected where it will be appropriate be require all users to have a “smart” gun. One area of major concern is malfunction when in use by a professional. These challenges however could be solved through research and development. R&D funding in the U.S. gun industry is quite extensive. The chart below shows per capita R&D expenses by gun manufacturers in the U.S.
Smart gun research and development in the gun industry is generally supported by all stakeholders. Even the National Rifle Association (NRA) does not completely oppose smart gun technology. The dilemma for the NRA is they don’t want to encourage technology that may become a restriction on gun rights. Federal, state, and local governments however continue to enact measures to encourage the technology. President Obama has outlined a plan to boost smart gun development. The president’s plan includes offering federal grants and cash prizes that will motivate companies to push smart gun technology into the market. The president’s main goal is to reduce gun related deaths by encouraging manufacturers to create and test smart guns. There will be millions in awards and grants offered to eligible manufacturers and companies who develop such technology. With such large funding on the table, the Federal Government must create clear guidelines for claiming rewards. The Department of Homeland Security and the Department of Justice will create standards and define what a smart gun is for manufacturers that plan to sell to federal, state, and municipal law enforcement agencies. The Department of Defense will help manufacturers test smart guns in development at the U.S. Army Aberdeen Test Center in Maryland. This testing center will confirm that the technology works in “real-world conditions.” This testing program will make manufacturers eligible for cash prizes as an incentive. In January of this year, a memorandum for The Secretary of Defense, The Attorney General, and The Secretary of Homeland Security was released promoting smart gun technology. For over 20 years, there have been efforts to increase the research in smart gun technology that will decrease deaths due to misuse of firearms. At this time, developing technology that would prevent tragedies is a crucial priority. Research in smart gun technology may eventually result in a fully functional smart gun, while also decreasing the growing number of accidental deaths due to the misuse of firearms. The conflict for the Federal Government is that they are concurrently trying to encourage smart gun technology while intentionally tightening overall industry financing. The State governments are providing similar incentives as well as described below. In 2002, the New Jersey legislature attempted to make it a requirement for handguns to be “smart” throughout the state. The Childproof Handgun Law stated that once “personalized handguns are available” anywhere in the country, then within 30 months all handguns in New Jersey will be required to be smart. The law was created to promote the development of smart guns but was not successful. The New Jersey statute specifies that the state will require a gun to be “smart” three years after smart guns are available in the market. Smart guns are yet to meet the commercial threshold, therefore the requirement for smart guns has not been triggered within New Jersey. Once the technology is perfected, however, through Research and Development it presumably would be mandated throughout the state. The New Jersey State R&D tax credit provides a 10% refund of the excess qualified research expenses over a base amount plus 10% of the basic research payments. The tax credit is currently offered as an additional incentive for businesses to increase their New Jersey R&D spending each year. Like New Jersey, California is also progressing toward the first law requiring smart gun technology. The proposed gun law waiting for a rule says that manufacturers must make guns that “won’t fire a bullet left in the chamber if their magazines are detached, and that will indicate when a bullet is in the chamber.” The magazine is where ammunition is stored. It also acts as a feeding device that is inserted to then allow the gun to fire. If California can achieve safety manufacturing requirements for gun makers, this may be the turning point for smart gun technology. California introduced a bill that will help small businesses utilize R&D tax credits. Bill AB-437 was last amended in May of 2015, will help small businesses take advantage in the form of cash grants, even with no income in the foreseeable future. The Research and Development Small Business Grant Program bill is projected to begin January 1, 2017. Although the federal government promotes innovation and development of smart guns, some lenders have restrictions on in funding an industry that is portrayed as inappropriate. In the U.S., the gun manufacturing industry generates over $32 billion in sales per year and employs over 200,000 people. Although the industry has a tremendous economic impact, there are bank lending underwriting standards that restrict growth. As many advanced manufacturing machine tools are coming from non-U.S. manufacturers such as Japan or Germany (which are not constrained by U.S. social policy) gun manufacturers may see foreign lenders as an ideal option. Although smart gun technology is encouraged within the U.S., many lenders are discouraged by the federal government in making loans to gun makers. While the administration supports smart gun technology, it is an interesting dilemma that U.S. lenders are constrained from providing funding based on U.S. policy. The iGun is a personalized smart gun with built-in innovative storage and safety features. The gun is activated by using an RFID-enabled ring that communicates with a chip inside the gun which unlocks it. There are only about 25 of these guns that exist, and are used for home protection. In order to get developments such as iGun to become commercial, it is estimated that about $5 million will be needed to build and test about 25 handguns, and another $15 million to commence commercial production. What is unique about the iGun is that it works within centimeters, making it nearly impossible for anyone other than the registered gun owner to activate the trigger. Armatix is a German company that created a smart gun to pair with an RFID-enabled watch in close range. RFID consists of the wireless exchange of information between a tagged object and a reader/writer. The main objective is to identify and differentiate items that communicate using radio waves. This technology activates or deactivates the weapon through a PIN entered on the watch. Wearable technology is a growing product that is driving technological innovation in all industries. 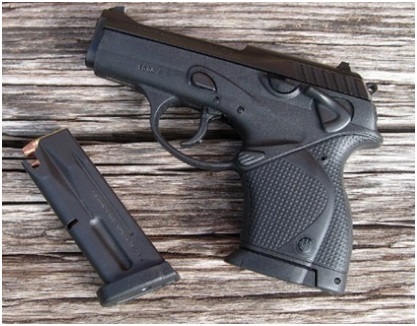 The safety in this technology is that it will automatically shut off after a period of inactivity or if the gun is further than 15 inches away. As a result of unsuccessful attempts to encourage smart gun technology, some wealthy individuals have recognized a need and acted to help encourage research. For example, a billionaire from Silicon Valley recently started the Smart Tech Challenges Foundation. The foundation has $1 million invested, which is being used to fun gun startups to build a smart gun with reliable identification technology. Former vice president of the family’s firearm company Mossberg & Sons, Jonathan Mossberg is a grant recipient for firearm technology. Mossberg is the developer of iGun discussed above, which enables RFID technology to allow gun use through a ring or watch worn by the user. Another grant recipient includes Kai Kloepfer. Kloepfer was in high school when he designed a handgun that was enabled by fingerprint reading. He is now developing a fingerprint enabled Beretta pistol. Smart guns have the potential to provide enormous social benefit by reducing death and injuries. Smart gun technology is going to require substantial manufacturing process and testing improvements related to the integration of multiple technologies. The required technology investments may be eligible for federal and state R&D tax credits.